The Ishikari Salmon Festival is a yearly thanksgiving event for the salmon held on the last weekend of September in Ishikari, a former salmon fishing village. 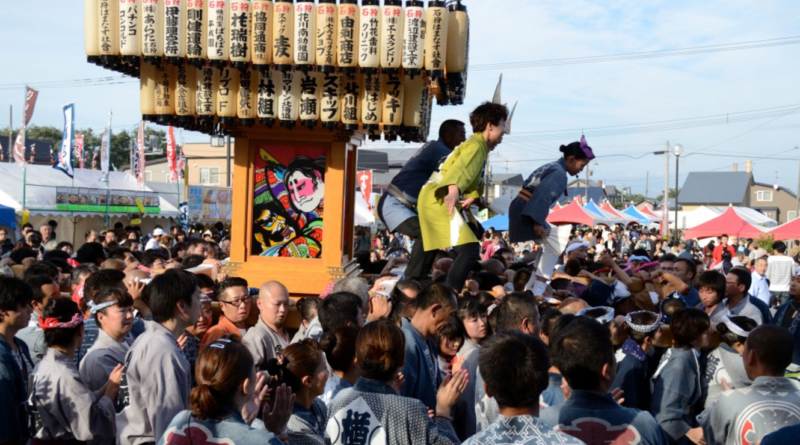 The closing event of the festival is the passage of a portable shrine (Mikoshi) through Benten Rekishi-dori, the historical street of old downtown Ishikari. Many “Katsugi”, the carriers of the mikoshi in this event, come from different towns. Some come from places as far away as Kushiro and Hakodate. They all proudly wear the colors (Happi) of the groups they belong to. Happis are traditional coats made of cotton bearing the crest of a particular group on their back. But why do so many different groups gather for the festival of this small community? Friendship is naturally one of the reasons, but another one is the effect of a declining and aging population. There aren’t enough strong people to carry the relatively big wooden structure there. Many small towns share the same problem, so during the busy festival season, groups from different communities spend the weekends giving each other a helping hand, or shoulder, in this case, to keep the festival alive. Unlike events in bigger cities, there isn’t a physical barrier between the mikoshi and visitors at the Ishikari Salmon Festival, so this is a great opportunity to see the mikoshi being swayed up and down to the rhythm of “washoi, washoi” shouts from up close. The mikoshi usually travels through Benten Reskishi-dori Street around 2:00 pm on Sunday during the weekend-long festival. About thirty thousand people visited the festival in 2014. Why don’t you take a peek at the festival, too!